Prone: The child is laid on rolls to avoid abdominal compression. Lateral decubitus with head rotated and flexed is an alternative. Pin fixation: Pin fixation is typically used to maintain the head in a flexed position and avoid pressure on the face. Caution should be taken when placing pins in young children or in patients with long-standing hydrocephalus who may have a thin cranium. Young children and infants may be positioned in a padded horseshoe with caution taken to avoid pressure on the eyes and face. Head flexion: Flexion is helpful for surgical exposure. Breath sounds and airway pressures should be checked after positioning to ensure that the endotracheal tube has not been kinked or shifted into the right mainstem bronchus with flexion. Midline scalp incision: The excision will extend from the external occipital protuberance to below the spinous process of C2 when removal of the C1 lamina is expected. Pericranial graft harvest: As a duraplasty is often necessary, the graft can be harvested from above suboccipital muscles at the beginning of the case before they have become dried from exposure. Midline dissection: The ligamentum nuchae is a relatively avascular tissue along the midline between the suboccipital muscles. It is incised, and self-retaining retractors are placed to move the muscles laterally. Exposure of the subocciput: Suboccipital muscles are separated from the occipital bone, posterior arch of C1, and superior half of the posterior arch of C2. Dissection of C1 should be subperiosteal with blunt instruments to avoid injury to vertebral artery and venous plexus laterally. In infants, dissection over C1 should be especially cautious, as the posterior arch may not be fully ossified. Craniotomy: The craniotomy should extend from just below the estimated location of the transverse sinus to the opisthion, extended as wide as possible bilaterally. Removal of the posterior arch of C1: The posterior arch of C1 should be removed if the tumor has caused tonsillar herniation or for large tumors with inferior extension. Dural opening: The dura is typically opened in a Y-shaped fashion, with caution being taken to avoid the enlarged occipital and circular venous sinuses. CSF drainage for relaxation: The arachnoid of the cisterna magna is then opened, and CSF is drained to relax the posterior fossa. At this point the operating microscope is brought into use. Identification of normal anatomy: Time is taken to identify the anatomy of the region including cerebellar tonsils, spinal cord, obex, arteries (PICA and vertebral artery), and cranial nerves bilaterally. Gentle elevation of cerebellar tonsils: The tonsils are then elevated to identify the floor of the fourth ventricle. Cottonoids are placed over the floor to protect the brainstem and spinal cord. 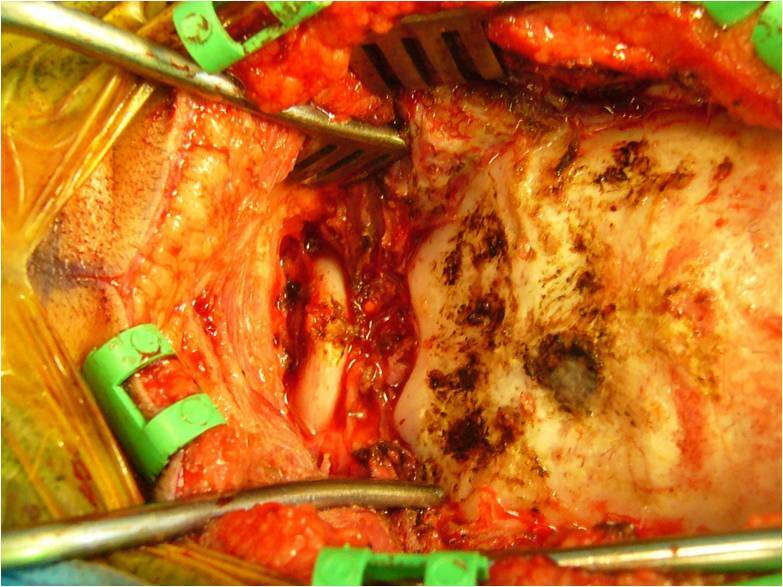 Resection of the inferior vermis: This resection may be required for intraventricular tumors that extend superiorly to avoid extensive cerebellar retraction. Telovelar (cerebellomedullary fissure) approach: This approach may facilitate resection of tumors that extend to the lateral cisterns and may eliminate the need for resection of the vermis. Intraoperative ultrasound: Before the tumor resection the posterior fossa may be inspected with the ultrasound to identify the echogenic tumor. Ultrasound can then be used to verify the completion of resection at the conclusion of the surgery. It may also facilitate the approach by identifying the path through the least amount of cerebellar tissue for tumors located in the cerebellar hemispheres or vermis. Tumor resection: The tumor typically is resected with a combination of ultrasonic aspiration and bipolar coagulation with suction. Orientation regarding the floor of the fourth ventricle must always be maintained to avoid injury to the brainstem. Small amounts of tumor that are clearly attached to the brainstem or firmly attached to cranial nerves are not resected. A small amount of tumor left behind (< 1.5 cm2 on postoperative MRI scan) is not associated with worsened outcome (1). Dural closure: Primary dural closure after tumor surgery in the posterior fossa is often difficult because some coagulation of the dura is usually required during dural opening. Duraplasty with pericranium or dural substitutes is commonly performed. Replacement of bone flap: The bone flap may be replaced to avoid the cosmetic deformity of unsupported nuchal musculature falling into the defect left when the bone is not replaced. Standard muscle and skin closure: The remaining layers are closed in a standard fashion.